System engineering (SE) using models (MBSE) is currently in vogue in the community of SE practitioners, whether they are analysts, architects, developers or testers. INCOSE has contributed greatly to the definition of a language for the community, henceforth standardized under ISO-19514: SysML. However, this language is not associated by default with any particular MBSE procedure. This is a major difficulty hampering its implementation. In order to overcome this difficulty, this book describes, in addition to the SysML notation, a generic approach based on the main principles of SE and relative standards, serving as the basis for a specific MBSE approach to be built. This is in order to respond to the specificities of the field of projects in which the practitioners evolve. 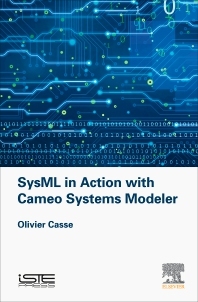 In order to carry out the procedure in a pragmatic way, a simplified but realistic example serves as a guideline from the initial requirements to the validation of the system, putting into action the SysML modeling tool Cameo Systems Modeler by No Magic. Olivier Casse is an independent consultant with more than 25 years of experience who regularly organizes training, provides consulting services and is an occasional speaker. He is primarily responsible for the field of embedded systems.